Friendship is a valuable and vital relation for an individual. It helps us to rely upon others than family. Friends help each other in time of crisis and enjoy the good times together as well. Sometimes we do feel that we are not that important in the group anymore. It does not mean that our value is somehow decreased. It is an indicator that we are not looked like a trustworthy friend anymore. But there are several ways through which we can be important among friends again. Help Them in Need: A true friend is that who help their friends in time of dire need. Friends are sometimes not able to ask for help but we know that they are in need of it. Such moments ask for true friends and without hesitation help your friend. Personal Space: Everyone loves their personal space. You love your own space and they love their own. Give them time and there is no need to stay in touch all the time. 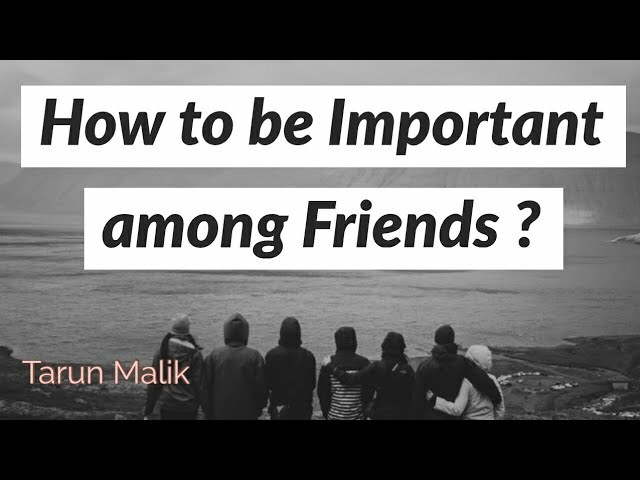 This will increase your respect and will help you to improve your ties with your friend. Let Go of Grudges: There is no friendship where friends are not making fun of each other. If somehow you feel offended for some reason then talk to your friend about it. Let them know more about you and this confrontation will leave no space for grudges. Hence the friendship will be fruitful and respectful. One thing we have to keep in mind is the fact that we are not doing the above activities for the sake of attention. We want our friendship to be true and unique. We put efforts into our friendship to make our friends comfortable in our presence. This will allow them to know that whenever they need help, you will be the first person in their list. That too because of respect. Indian Hypnosis Academy always promote good values and respecting behaviour among masses. Our personality reflects how deep rooted we are with our values. If you need any help in overcoming any psychological problem then feel free to contact us. Subscribe our YouTube channel for more.